Set in Mexico in the early 1900′s during the time of the Mexican Revolution, the novel tells the story of Tita, the youngest daughter of a well-born rancher who falls in deeply love with Pedro, from a neighboring family. Unfortunately for Tita as the youngest daughter, family tradition dictates that her destiny is to remain single and care for her dominating, aging widowed mother, but she falls in love with Pedro anyway. Her mother quickly acts to stop it by making her sister marry Pedro, which he does to stay close to Tita. Tita’s only outlet for her passion and emotions is the food she cooks, causing those eating the food to experience everything Tita is feeling when they consume her food. 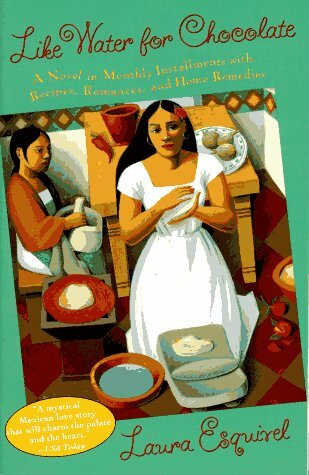 It is a fun, fanciful and often poignant story of love, life and of course food, wonderful food! The book is divided into twelve chapters, one for each month and a recipe starts each chapter. The book itself is a great starting point for inspiration, or pull out your Mexican cookbooks (Rick Bayless and Diana Kennedy are wonderful sources). “I’ve read through all the entries, and understand that some (most) might think that my perception was a bit rose-coloured… Of course, not every day or every person I met was great, but the book is a condensed recounting of over 10 years of travel, so the good people, the ones you tend to associate with an experience or a country, tend to stand out. I think another thing that contributed to my wealth of good experiences was the fact that I was often on a bike, so people feel like they need to take care of you. I’ve been on a few trips without the bike and there has definitely been less food offered! I guess when you’re on a bike, it’s obvious that you’re hungry… So it’s a good match for those interested in the food of a place.